I’d like to think that I don’t really put too much value in having “things” as I get older. Maybe its age, wisdom, or my brush with cancer; or maybe it’s having two cats that run around the house willy-nilly and have broken several of my favorite knickknacks. Over the years I’ve collected music boxes, rocking chairs, and pieces of my brother-in-law’s beautiful pottery. I’ve treasured many of these things and had them decorating my homes over the years, but there are not many “things” I’d describe as prized. Today when I read the writing prompt I thought, there is one thing that if I could choose only one to keep forever, it would be my engagement ring. Or as my husband likes to call it, his boat–he was saving for a boat but bought me a ring instead. He asked my parents for permission to marry me and showed them the ring a whole week before he popped the question. I know, it’s a sweet story. It’s why I do, and will always, consider it my pride and joy. 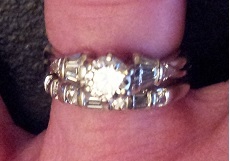 Thank you Steve, for giving up your boat to buy me this breathtaking ring. Such a delightful story. It is a beautiful ring!! Thank you so much, I’m so glad I shined it up before I took the picture to post. Thanks too, for stopping by and reading!